Multiple Activation Key (MAK) activation occurs directly with Microsoft (different from Key Management Service [KMS], in which activation occurs through a local host server). If your organization has 6 to 49 computers that need to active Office 2010, we recommend that you use MAK proxy activations managed through Volume Activation Management Tool (VAMT) (http://go.microsoft.com/fwlink/p/?LinkId=183042) for all computers that can connect to a MAK proxy server. 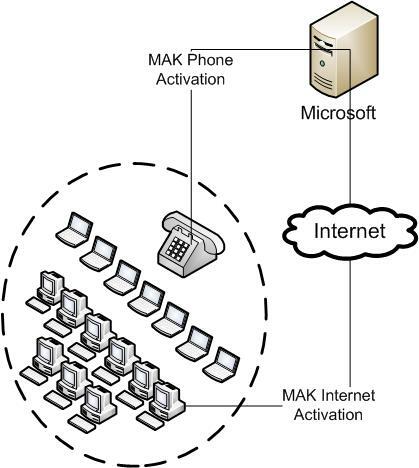 For those computers that are isolated from the corporate network or the Internet, we recommend that you use MAK independent activation through the telephone. The following is an example of a network that can use MAK proxy activation. Contoso, Ltd. has 15 desktop computers and 10 portable computers in their single office. The desktop computers are connected to the Internet, and the portable computers are isolated from all networks. The solution is to use VAMT (http://go.microsoft.com/fwlink/p/?LinkId=183042) to manage the MAK proxy activation of the desktop computers through the Internet, while you independently activate the portable computers through the telephone. The following articles will help you make sure that your deployment of Office 2010 is properly designed for MAK activation. To configure each computer for MAK activation, see Customize Office 2010. Follow the relevant procedure to configure Office 2010 by using the Office Customization Tool (OCT), the Config.xml file, or the Microsoft Office Backstage view. To obtain the product keys for Office 2010, register on the Volume Licensing Service Center (VLSC) (http://go.microsoft.com/fwlink/p/?LinkId=184280) Web site. Your license agreement determines the number of MAK activations that you are issued. To activate Office 2010 by using MAK proxy through VAMT, follow these steps. In VAMT, under Product Keys, enter the MAK key in the Product Key field, and then click Verify. Right-click the computer on which you want to install the MAK key, select Install Product Key, select the MAK key, and then click OK.
To activate Office 2010, right-click the computer name, select Activate, and then select Proxy Activate. You must provide administrator permissions for the selected computer. If you have 6 to 49 computers in a department or group that are not connected to the corporate network, we recommend that you follow the MAK activation recommendations in this article. If you increase the number of computers to 50 or more, we recommend that you use KMS activation as the activation method for all computers that can connect to a KMS host server. For more information, see Plan KMS activation of Office 2010. Any other computers can activate with MAK by the methods previously described. Download and install the VAMT 2.0 tool (http://go.microsoft.com/fwlink/p/?LinkId=183042) on the MAK proxy server. Follow the instructions on the download page. For more information about how to use VAMT, click Help on the VAMT 2.0 menu bar. For examples of scenarios that require KMS activation combined with MAK activation, see Scenario: Secure network - KMS or MAK activation of Office 2010, Scenario: Disconnected computers activating Office 2010, and Scenario: Test or development lab activating Office 2010.